NEW DELHI: Having missed several deadlines, and with China taking big strides, India is trying hard to speed up its infrastructure commitments in Myanmar. India's tardiness in project implementation has marred its reputation, even though India has extended over $1.75 billion in grants and credit to Myanmar. Indian envoy to Myanmar Vikram Misri said India had completed building the Sittwe power and the inland water terminal in Paletwa. Speaking to a local publication, Global Light of Myanmar this week he said, "We have just awarded the contract for the final stage which is the road to be built from Paletwa to apoint called Zorinpui which is on the border with Mizoram. I think the creation of this transport corridor, once it is fully functioning, has the potential to transform the economic landscape in the states through which it goes, Rakhine and Chin." Construction is expected to start in October, with a Rs 1,600-crore contract awarded for building 109-km road connecting Paletwa river terminal to Zorinpui in Mizoram. Aizawl: A committee will be set up for identification of gaps in basic facilities and infrastructure along the India-Myanmar border and prioritise them for measures in the short-term, medium-term and long-term, Home Minister Rajnath Singh said on Monday. "The panel, under the chairmanship of secretary, Border Management will find out and pool all resources and dovetail programmes of various ministries including those of North Eastern Council, Non-Lapsable Central Pool of Resources (NLCPR) and Border Area Development Programme (BADP)," he said. The home minister made the announcement while stressing on better connectivity with Myanmar. The committee will submit its report taking into account short-term (three years), medium-term (three to six years) and long-term (six to ten years) before the end of the year, Singh said. NSCN-K leader Khaplang is dead. His faction drew support from tribes straddling the Indo-Myanmar border, which gave him great influence on the Naga insurgency. Recall that his faction was responsible for ambushing the Dogra regiment in Manipur, in 2015 leading to the first official cross-border reprisal. The reprisal was intended to take him and other leaders out, but they must have been tipped of since it turns out that the camps were empty when struck. Khaplang was a malign influence - the Myanmar government informally ceded control over some territory on the border to him, and he in turn adopted an unyielding position on the formation of independent Nagalim. His stance badly undermined other moderate India-based NSCN factions and have stalled implementation of the framework accord signed by the Modi government. Of course, there is a possibility that they were all on the same page and playing good rebel bad rebel with GoI. However, N Ravi has cleverly structured the framework agreement to not progress until all stakeholders, and not just NSCN-IM, are on board. Khaplang leaves behind a highly structured organization, and his successor Khango Konyak was named hours after news of his passing broke. Khaplang also left a parting statement for his faction, urging them to fight on. Will they? His successor is, like Khaplang, in his 70s and known for his hard line. However, he is India born and his ability to derive support from Myanmar at the same level as Myanmar-born Khaplang remains to be tested. There is also unremitting pressure from GoI on Myanmar to align its response to NSCN-K, and this development, at the least, is a chance to break the current stalemate. I don't follow SSRS, but looks like he is making a difference in a good way. Are the naga tribes on the other side of the border also under the Southern Baptist Church? Or do they still follow indigenous religion. An NSCN (IM) source said they will not decommission the arms, adding that the present “Naga army” will be commissioned as a regular army as part of the agreement to have a joint defence between the NSCN (IM) and the Union Government to look after the security of Nagaland (Nagalim). “There shall be no decommissioning of arms in our agreement as we will have a joint defence force,” said a source from NSCN (IM). A source said Naga army will be commissioned as a regular armed force and jointly look after the defence of Nagaland. Nagalim is different from Nagaland in that it cannibalizes areas from many of the other states as well, will these states agree to these forces securing their areas? Last edited by pankajs on 25 Aug 2017 21:16, edited 1 time in total. could you kindly post this in the Myanmar thread. Tried to bring more attention to Congress govt minority appeasement, vote bank politics and NE terrorism by interviewing a few folks from the NE with more pointed questions. Will be doing more of these, on the other NE states as well. Hoping to bring out more views on Bangladeshi immigration and concerns for people of the NE. Let us know if any feedback. Thanks again. Also tried my Damnest to get the you tube link working but doesn't seem to work for me? In Meghalaya, Garo national liberation army(gnla) chief Sohan D Shira has been killed. what does this mean for the various armed movements in Meghalaya. few years back stan used to make very good posts on NE insurgents. could you give us an update ? ricky_v wrote: Nagalim is different from Nagaland in that it cannibalizes areas from many of the other states as well, will these states agree to these forces securing their areas? Looks like an expansionist agenda. The problem with being homogeneous(in a sea of people) is that you can get diluted, swamped, ignored and forgotten. This is why being unique becomes a survival strategy. In most places in India, caste is a way of preserving a unique identity, to attract visibility(notice me, I'm unique!!) in a nation of a billion where you can get lost. Something similar happens in the north-east. While it is not as clearly specified as the varnas but the purpose is the same. Now since it is not clear as the varnas, the separation is not clear and there are overlaps which create tension and that familiar feeling of "existential crisis". Back to your question. Due to the advance of high speed internet, many of the ethnic groups have been able to project their presence through social media and YouTube. Militancy is on the decline but it exists in skeletal form, particularly in the corridors of assam-meghalaya. Nagaland rebels have changed their ways(preferring kashmiri style propaganda over guerrilla warfare) and only project power when absolutely required. Mizoram is content with its statehood and enjoys its isolation. The rebels in the assam-meghalaya corridor sometimes act like a mexican drug cartel. ^Thank you for your insights NVishal. Look forward to your posts. BJP initiated the so-called "peace process" deal with the rebels in nagaland in 2015 which has given the modi govt some traction in nagaland. The nagas believe absolutely that the peace deal is all that stops them(the tribes) from excelling to their full potential. Imagine that X and Y have always been in hostile terms with each other. Y in the underdog. X can defeat Y anytime but exercises restraint. Meanwhile, Y has made no secret that it hates X, in words and through action. Time has passed in rivalry and ambitions have forced Y to make amends with X but X is not interested. So Y starts forcing X to make peace but X is still not interested. Y is uncomfortable. Y cannot sleep. Y knows history well and wonders about X's intention. Will it take the final revenge? This fear of uncertainty is what compels Y to make peace(hopefully under its own conditions). 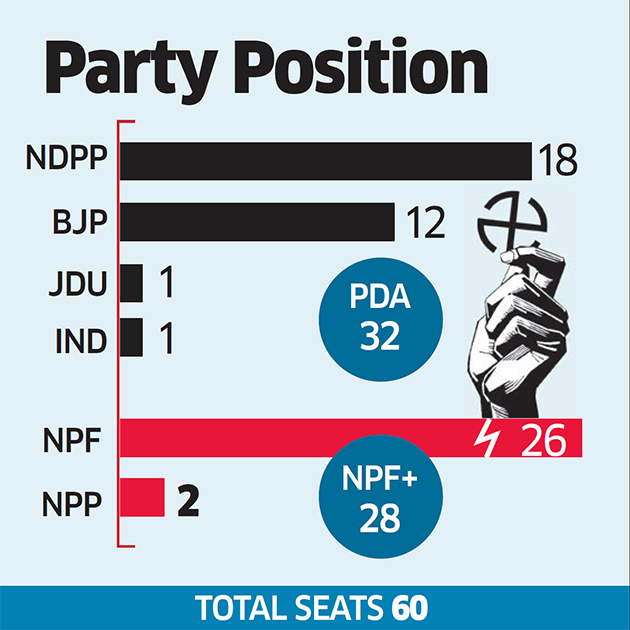 The new deal may see some greater autonomy for the nagas within nagaland. This may include a tax collection agreement. The rebels might be given positions of power in the nagaland govt. This is all gossip from my side. 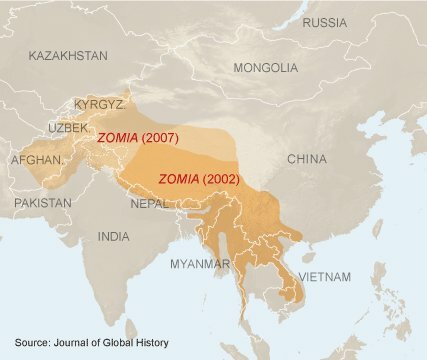 The attempt by new delhi will be to contain the (in)stability(zomia culture) within the zomia periphery. Don't expect these regions to function like any other indian state any time soon. If the locals are happy and feel secure(under indian guarantees), maybe the local administration and local police will enforce a state worth tolerating. Mizoram is a good example. The Union Home Ministry has removed Armed Forces (Special Powers) Act (AFSPA) from Meghalaya and reduced it to eight police stations in Arunachal Pradesh, an official said on Monday. 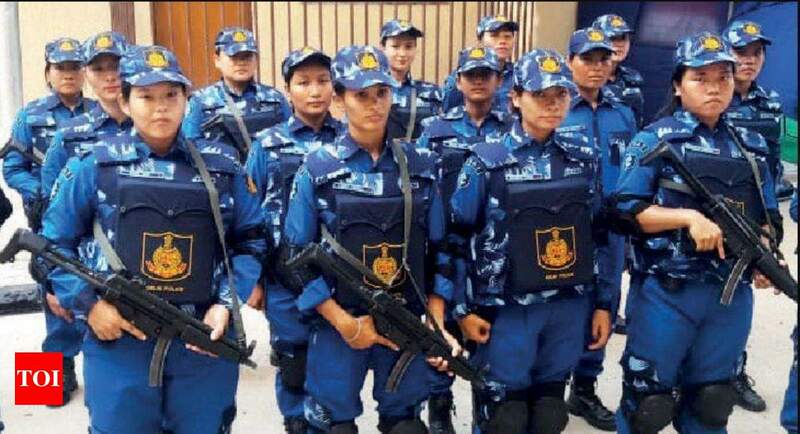 The Act has however been extended by another six months in three eastern districts of Arunachal Pradesh -- Tirap, Longding and Changlang -- which border Myanmar and specific areas under eight police stations of seven other districts bordering Assam. The three districts have been under the AFSPA since January 2016. The Act was withdrawn from Tripura in 2015 and in past one year, fewer areas in northeast are under the Act, the official said, adding that the Act was only in place in Meghalaya for a 20-km area along the Assam border and not in operation in Mizoram. In Assam, 63 NDFB(S) cadres killed and 1052 cadres/linkmen were arrested between December 2014 and March 2018. Compared to 2016 there has been a 37 percent fall in insurgency incidents in NE region; 30 percent reduction in forces killed; and 23 percent fall in civilians killed. Between 2014 and 2018, there has been a 63 percent decline in insurgency incidents in NE; 83% fall in civilian deaths; and 40 percent fall in security personnel killings. BOGIBEEL: In a major boost to defence logistics along the border with China, India's longest road and railway bridge connecting Dibrugarh in Assam to Pasighat in Arunachal Pradesh is likely to be inaugurated later this year by Prime Minister Narendra Modi. The Bogibeel bridge is likely to be inaugurated by Prime Minister Narendra Modi by the end of this year, officials said. The bridge, which is the second longest in Asia, has three lane roads on top and double line rail below. The bridge is 32 metres above the water level of the Brahamaputra and is fashioned on a bridge that links Sweden and Denmark. For the government, the bridge, officials said is both a symbol of development in the northeast as well as part of a strategic move solving logistical issues for the armed forces stationed at the China border to get supplies from Tezpur. India and China share a nearly 4,000 km border, with almost 75 per cent in Arunachal Pradesh. Though approved in 1996, construction of the bridge was initiated by the first BJP-led NDA government in 2002. The government is considering Assam as the next state from where it may remove the controversial Armed Forces Special Powers Act (Afspa) after Meghalaya, as high-level consultations are going on between the Centre and state for the possible road ahead. Sources told ET that the Centre is examining the issue and will reassess the security situation in the state after a Supreme Court-ordered count for the national register of citizens is completed by May-end. The Centre and the state are in broad agreement that the Act needs to be removed as the situation gradually becomes normal in the state and a window for broader consultations opens up before the end of August this year, when the current extension of Afspa comes to an end. 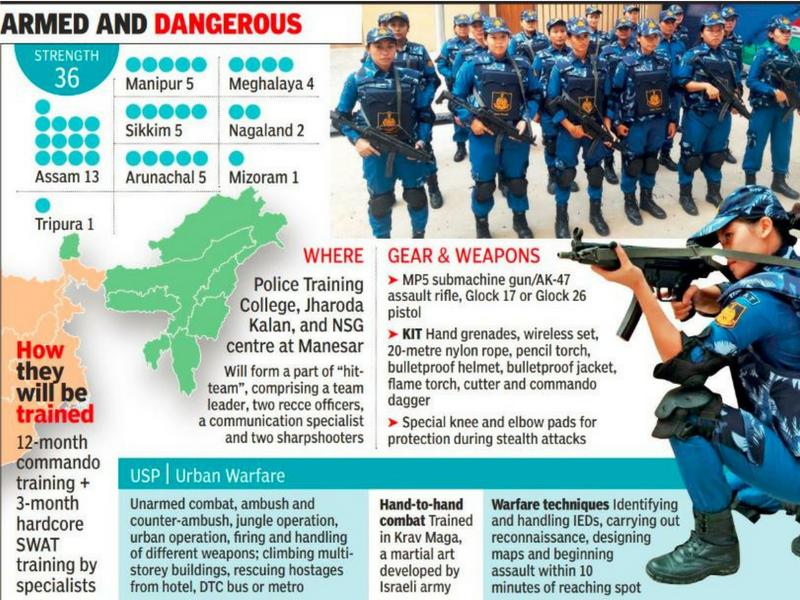 Sources said that while districts such as Guwahati, Nagaon, Morigaon and Golaghat are being monitored only by the state police forces, insurgent groups such as ULFA and the NDFB(S) are active in other parts of the state. These areas, they say, may need longer time to stabilise before the armed forces can be fully removed from all operations. Here's How Sikkim Became An Integral Part Of India On This Day In 1975. One of the most beautiful places across the length and breadth of the country, Sikkim, became a part of India on this day in 1975. Sikkim did not become a part of India when it became an independent Union in 1947. At that time it was just the buffer state between British India and China. However, it remained under the protection of India and until 1975 it remained an Indian protectorate but an independent state. Here is the timeline of Sikkim as the state until it officially included in Union of India. 1. Sikkim as a state came into being in 1642 when the rule of Chogyal dynasty and 1890 it came under British rule and became of protectorate state of British. It meant that it came under the jurisdiction of the British and acted as buffer state between China and British India which also included Nepal and Bhutan. 2. In 1947 with India became independent and Sikkim became India’s protectorate but Sikkim’s foreign policy, security and communication came under India’s rule with the state retaining independence internally. 3. But Sikkim’s monarch’s always shared a tense relationship with India and the big problem came up when the state’s last monarch Palden Thondup Namgyal married a US citizen Hope Cook. Some say she was CIA agent. She took over the Sikkim governance in her hands which not only undermined the government operating in Sikkim, but also India’s role in the state. 4. In 1975, the people of Sikkim rebelled against the monarch. Many believe that citing the poor relation with monarch India fuelled the rebellion, but soon the violence in the state crossed bounds and monarch’s loyal were killing people. 5. Seeing the law and order cripple, India intervened militarily and restoring the order. The 1967 batch IPS officer Ajit Doval, who is currently National Security Adviser went from Mizoram to Sikkim and handled the entire operation. Sikkim’s first chief minister Kazi Lhendup Dorjee was supporting India throughout this. Since then Sikkim remained with India and stands as one of the most sought-after tourist places. R. N. Ravi, interlocutor for the Naga talks, told the committee that it was a departure from their earlier position of “with India, not within India,” and that the government called it a framework agreement and signed it. The details are part of the 213th report on the security situation in the Northeastern states tabled by the Parliamentary Standing Committee on Home Affairs in the Rajya Sabha on Thursday. The committee was also informed that the “contours” had not been spelt out in the framework agreement that was “just about the recognition of the uniqueness of the Naga history by the Government of India”, and some special arrangements will have to be made for the Nagas. “The Interlocutor apprised the committee about the broad status of the negotiations that boundaries of any State will neither be changed nor altered. Initially, the Nagas had stuck to the idea of unification of Naga inhabited areas, resolutely maintaining their stand of ‘no integration, no solution.’ However, they have now reached a common understanding with the Government that boundaries of States will not be touched,” the report said. The NSCN-IM has been fighting for ‘Greater Nagaland’ or Nagalim — it wants to extend Nagaland's borders by including Naga-dominated areas in neighbouring Assam, Manipur and Arunachal Pradesh, to unite 1.2 million Nagas. The Chief Ministers of the three States have warned against any tinkering with its boundaries. The final list of Assam's NRC database will be released today. In an airconditioned office room piled with files and papers, Prateek Hajela, special secretary to government and NRC coordinator, simultaneously used an i-Pad and desktop to explain the complexity of his work. Over nearly four years, the NRC has entered into its database nearly 66 million documents (about 500 truck-loads, he estimated), from birth, school, college certificates to electoral rolls to land and local-government records submitted by 32.5 million people–Molla was one of them–anxious to prove they were here before 24 March, 1971. More than 50,000 state government officials went door to door verifying records, and computer programs were deployed to spot fakes. There may be documents that may not be forged but are not true, said Hajela, referring to “contaminated” electoral records–fake rolls prompted the Assam agitation–fake income-tax PAN cards and birth certificates. “Some (documents) are forged, but a large number are not forged, so I have to go by descendents, otherwise I will be legalising everyone who is illegal,” said Hajela, an electronics engineer from the Indian Institute of Technology, Delhi, and member of the elite Indian Administrative Service. Descendents are the crux of the issue for the NRC, since the original number of living people born before 1971 is–by his reckoning–about 4 million. The descendents of these 4 million are now trying to prove they are Indians. Apart from home visits to verify identity and cross-checking millions of documents with thousands of institutions that issued them, the key method of trying to attempt accuracy is the family tree, which the NRC generates from its database. A computer programme matches grandparents, with children and grandchildren. Officials call everyone on the family tree to test if they can name everyone in the family. Some lies have been caught. For instance, tens of people claimed to have the same mother or father, with family tree questioning revealing their inability to name their siblings or grandparents. Of 66 million documents submitted by 6.8 million families–about 32 million people–in Assam, the NRC had verified 49 million documents by October 2017. Hajela would not say how many people had been found illegal. He will submit the final list of illegals to the Supreme Court, which will decide when it will be made public. ^ Assam belongs to the ethnic locals groups of Assam. The state needs another survey to separate locals from non-locals. Currently, the state is swamped with bangalis(both Hindu and Muslim). The burden of bangalis should fall lonely on the state of west Bengal. The state has become a modern day ambhiraj. nvishal wrote: ^ Assam belongs to the ethnic locals groups of Assam. The state needs another survey to separate locals from non-locals. Currently, the state is swamped with bangalis(both Hindu and Muslim). The burden of bangalis should fall lonely on the state of west Bengal. The state has become a modern day ambhiraj. No sir - Assam belongs to Indians. If Bengalis (or anybody for that matter) choose to settle there, as Indians it is their choice. Like it is their (and Assamese) choice to come and settle in Bangalore. Or Delhi or Mumbai or Pune. Or anywhere in India. Settle and vote and buy property. We don't break India this way - we've had enough of J&K problem as it is. On what grounds then do some states have Inner Line Permits ? ILP is almost like a visa to a foreign country supposedly to "protect their culture". Either all of it (ILP, Article 370) has to go or else every state should be entitled to restrict entry, property ownership..etc especially if it's native inhabitants are about to become a minority as is the case with Assam. Assam belongs solely to the ethno-linguistic cultures local to assam. The same applies to every ethno-linguistic state in the Indian union. What you envision is nothing less than a cocktail of violence and civil wars. Fact is, with the establishment of biometric identity system, it is just a matter of time before each state in the Indian union pass their own local citizens bill in their respective parliaments. This is important to secure the future of the Indian union and has been the old and tested method to preserving hindusim through centuries of conquests and various other foreign rule. The first shake up will likely begin through the states of Maharashtra and Karnataka and spread nationwide through there. I have observed this buildup for some time now and I think it is a reality which needs to be acknowledged. Don't talk garbage. The Indian constitution gives rights to people to settle down anywhere except in special cases like NE and J&K. That is the basis of Indian nationhood. You seem to believe that the Indian constitution was written on stone by gods and it will hold till the end of time. If Mr. X has the power to make a law, then Mr. X also has the power to break/change that law. Migration effects culture. It effects language, social customs, belief etc. Hindus are not a homogeneous group. They all have their own things going on. A Muslim state, a sikh or a tribal state resisting the Indian union is one thing. But a few or more Hindu states resisting the Indian union will pull the rug out right from underneath your feet. My solid advice - keep that "India belongs to all Indians" nonsense to yourself. You have to respect history and ground reality. State regulated migration will not only empower the Indian union but it will also break some expansion aspirations of a few odd castes that are primarily responsible for using the current open migration as a strategic tool. You should move to Uganda. Or join the Hurriyat. India is for all Indians. A few Indian States are culturally unstable and will eventually collapse. The issue is not with those states collapsing but with the aftereffects trickling into stable states in the immediate neighbouring vicinity - the domino effect. In ancient India, the system of princely states was intrinsically capable in managing these situations. If one state collapsed, it was just a matter of time before one of the neighbouring kings invaded and reenforced dharma. nvishal wrote: Assam belongs solely to the ethno-linguistic cultures local to assam. The same applies to every ethno-linguistic state in the Indian union. What you envision is nothing less than a cocktail of violence and civil wars. Its true that no indigenous inhabitant of any state wants to see themselves turned into a minority within their own state - be it from illegal foreign migrants or sadly even a hoard of Indians from other states. It's a tricky issue as economic well being, preservation of cultural identity, linguistics and so many other things are tied in with it. Larger population ethnicities with the capacity to swamp their neighbors do not feel this threat as much as ethnicities in states with smaller populations. Assam has a right to remain majority Assamese. That was the whole point of joining the union. If the cental govt fails to preserve it as so, then the state is entitled to take actions it deems necessary. NVishalji, however much I would want to disagree with you, I have a feeling that this issue is going to morph into a significant challenge for Indian nationhood. The bigger picture is beyond illegal immigration and linked to possible 'son of soil' rights issues across states. It is true that Assam belongs to the ethnic local groups, but at what point would you say that the people who migrated to live there well before 1950 belong there or they become an ethnic local group themselves? or do we say the quota of becoming ethnic locals has been filled? also how do we define ethnic local groups? do we say it is based on culture, or simply the right of the land. Right of the land will be very hard to determine as Assam have been under Bengali rulers as early as 9th century (maybe earlier but this is what my limited history knowledge supports) and that point to movement of people. Culturally is another way to determine who have adopted the Assamese culture but then the issue becomes who's going to bell the cat. I have seen many ethnically Bengalis who identify themselves as Assamese (Point in case our fav. anchor at Republic ), wouldn't that be a proof of cultural integration? This is a very very complex issue which cannot be solved just by moving a bunch of people. Also IMHO this is a very very good lesson for not only Assam but rest of the country to take note, debate and find a work around as this issue is going to come and bite in our asses on other parts of the country too. I said work around because a solution is not possible without either breaking fabric of society or the constitution (or both as I have complete faith on the politicos of my country to F up any issue). A work around from me is to have address registration of each and every person at local municipalities or even smaller local bodies of the place of residence. New Delhi (Sputnik): Major tensions are brewing in northeast India with locals accusing the Modi-led government of conceding large parts of land to Myanmar. The issue came to focus when local officials, after inspecting the border, claimed that border pillar 81 was erected at least three kilometers inside the territory belonging to the Indian state of Manipur. This could be an issue being created by vested interests to create a wedge between India and Myanmar. Most probably it started with villagers saying that the border stone was moved. Whether it was moved or who moved it, need to be investigated. So by creating a diplomatic issue the one's who will benefit the most are Jihadi Pakistan and their Arakan Liberation Army. The recent attack on Assam rifles by ALA need to be avenged by eliminating this terror group forever from Myanmar. What's required is a joint operation against ALA by the Indian military and Myanmar and continuging such a operation into the future. Hope diplomats of both countries are at work. ^^ According to reports from villagers, the Myanmar army crossed over the border and carted away machinery from a saw mill in territory that was India claiming it was Myanmar's territory. Could have been a bunch of corrupt Myanmar soldiers or could be part of something bigger. Needs to be investigated all the same. New Airport opened in Sikkim. A kind of ethnic cleansing is going on in Mizoram. The indigenous Hindu Bru population got driven out and ended up in refugee camps in Tripura and elsewhere. They were not allowed to return for decades. Now the Mizos want them deleted from the electoral rolls because they are not within the state to cast their vote. Classic case of ethnic cleansing. The election commission official Shashank allowed the Brus to vote from their refugee camps outside the state. But big protests erupted in MIzoram seeking his ouster for doing his job - and the center has complied. As usual, Hindus are being screwed over and driven out. Soon this same strategy will be used elsewhere. ILP, Article 370 and other such provisions should really be scrapped for all states. Its promoting nothing but ethnic cleansing, separatism and division of the country. Either all states are equal or they are not. To have a 2 tiered system is to guarantee the eventual dissolution of the country.